From the tour that brought fans more than 200 hours of music across 61 dates in the form of double set, three plus hour shows sans-opener, Eric Church releases the next 30 live recordings of his 61 Days in Church. Having delivered the first 30 Holdin’ My Own Tour live recordings on September 1st, Church plans to continue subsequent releases throughout the year in chronological order of the tour to complete a total of more than 100 tracks. 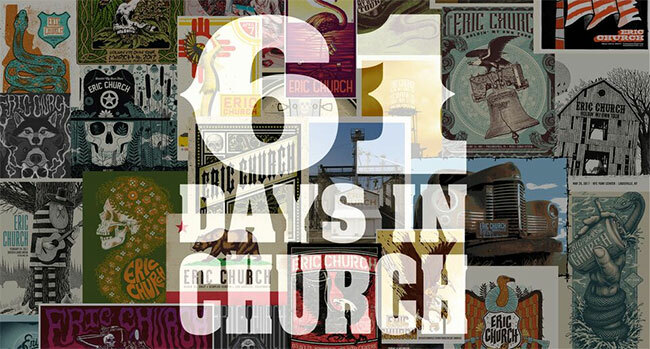 The man Rolling Stone Magazine deems “the most consistently engaging live arena act in country music,” Church’s 61 Days in Church includes a variety of catalogue cuts and singles as well as cover songs inspired by each tour stop. The wide assortment of tracks in the collection are a reflection of Church’s version of, as he told Billboard, “calling an audible,” and making a decision on fresh songs for each stop upon arrival. The 61 Days in Church recordings will initially be released only on the Apple Music platform for a two-week period before being made available on all streaming services. Unique, individual tour posters from each tour stop serve as the artwork for each of the songs’ releases. Physical release of the music will be released soon to meet fans’ demand for the full collection.